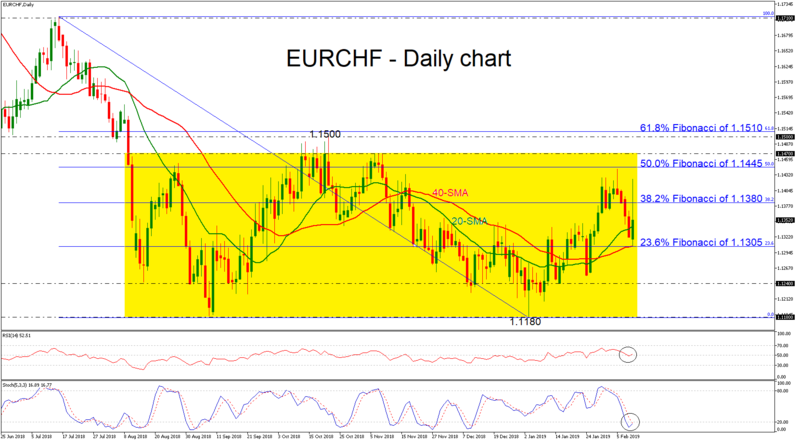 EURCHF created an aggressive upside spike on Monday, after the bounce off the 40-simple moving average (SMA) in the daily timeframe and on the 23.6% Fibonacci retracement level of the downward movement from 1.1710 to 1.1180, around 1.1305. Currently, the pair is consolidating within a sideways channel with upper boundary the 1.1470 level and lower boundary the 1.1180 support. Upsides moves in the range are likely to find resistance at the 38.2% Fibonacci of 1.1380. There is an important resistance zone between the 50.0% Fibonacci of 1.1445 and the 1.1470 hurdle which is the next area for traders to turn their attention to in the near term. A jump above this level could challenge the upper boundary of 1.1500 and the 61.8% Fibonacci of 1.1510.